There are two responses of family and friends that really hurt lupies. The first is simply denial, or minimisation. 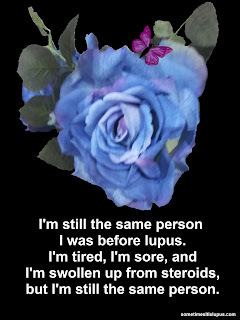 People who claim to love someone with lupus, then refuse to believe the amount of pain, or fatigue they say they have. Lovely Lupie gets branded as lazy, or a hypochondriac, or just told to get over it. 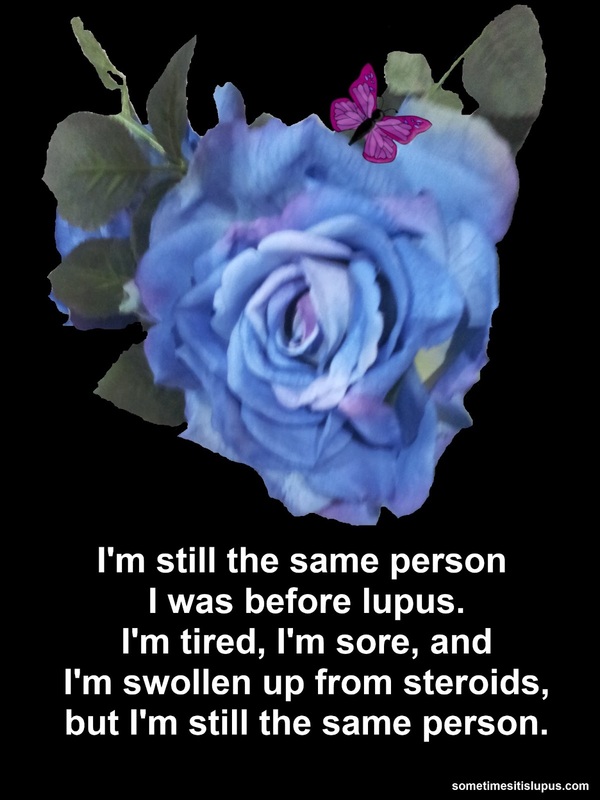 The second is making the lupus more important than the person. This is where "I can't love you if you're sick" comes in, or the families who tell their Lovely Lupie "you're a burden, we'll be better off when you die" and all sorts of equally horrible things. Then there are the great families, the ones like my kids, who just accept me as the same person, and we work around my limitations. They're happy when I can do things, and just accept when I can't. When we went on holiday together, they were even happy to have afternoon nap time as part of our daily routine. Some Lovely Lupies even have great marriages, with a partner who works with them to overcome the challenges of daily life. I haven't experienced that, but I know it must be incredibly precious to those who do. Inside these bodies that cause us pain and the frustration of not doing what we want them to do, we are still the same people we always were. Lupies everywhere really appreciate the people who can see that, and can love us as the people we are.